Economy actually *contracted* 1% in 1Q 2014. Last month, when the Bureau of Economic Analysis announced that gross domestic product had grown at a lead-footed rate of 0.1 percent in the first quarter, economic analysts could focus on two pillars of hope. The first was that the winter weather was unusually awful, and first-quarter growth probably reflected that. And the second? This was a very preliminary number, and it seemed reasonable to think that it might be revised upward. The operative word is “seemed.” Now the BEA has provided its first revision, and things only get more dismal: The economy actuallycontracted in the first quarter instead of just lying down on the sofa and feeling all mopey and sad. Key areas of decline were exports, inventories and nonresidential fixed investment. In other words, whatever happened was happening on the business side. Megan McArdle is not yet ready to say that we’ve hit the iceberg, and that’s fair: after all, it’s not OFFICIALLY a recession until the economy contracts two quarters in a row. Then again, even if the economy does contract two quarters in a row it still may be a while before we ‘officially’ call it a recession, if you know what I mean (and I think that you do). One of Megan’s points here, though, is that the situation is sufficiently bad that the economy just doesn’t have any margin any more. Essentially, we’ve been drifting into iceberg-infest waters for some time now. Will one hit? Will we miss them all? I don’t know! Neither do you! And certainly, neither does the President! PS: This is one reason why we like to have people with actual executive experience run for President. A governor may or may not know how to fix a problem – see pretty much every Democratic governor in America for examples – but at least he or she understands the parameters of it. In contrast, Barack Obama is still peevishly waiting for the person to come in and tell him what he has to do while the real experts fix things. At least, that’s how it’s always worked in the past. But where can @barackobama expect to get a bounce? If the president’s job approval is still around 43 percent in November — lower than it was on Election Day in 2010 — the question would probably not be whether the Democrats will hold the Senate, but whether Republicans can win 54 or 55 seats. Given the numbers right now, that should not be unthinkable. But there’s a flip side to this. If Obama’s job approval does bounce back — which is exactly what happened in 2012 — there’s a reasonable chance that Republicans could walk away from this cycle with just a handful of pickups. Jonah Gol… God, @BarackObama is just a twerp, isn’t he? After a while you almost get numb. …Obama told CNBC’s John Harwood that Wall Street should be far more panicky about Republican efforts to use the debt ceiling to win concessions from the White House. I don’t blame Obama for being annoyed with Republicans for trying to use the debt ceiling the exact same way he did when he was a senator. But normally a sitting president doesn’t try to talk down the economy just to win a political point. 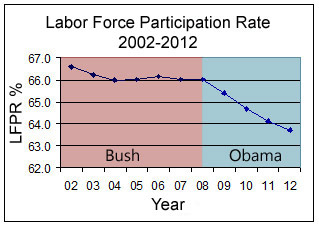 The grim labor force participation rate graph. Rep. Paul Ryan: back in the fiscal wars. When Mr. Ryan returned to Capitol Hill last week, he was met with a standing ovation from his Republican colleagues, a bear hug from Mr. Boehner and the hope from conservatives that he would hold the line on taxes and other spending. #rsrh A look into the impact of Obama’s recovery-killing economic policy. Under Obama’s policies, the young (who want jobs) can’t find ’em; and the old (who shouldn’t need jobs) have to go looking for ’em. But hey: let’s give the President four more years. I mean, how dare we judge the man using the bourgeois, capitalistic, and possibly heteronormative-patriarchal-privileged ‘standard’ of ‘competence?’ Don’t people understand that the Left have issues to work out? Deconstructing this week’s Democratic economic agitprop. (Via Hot Air) Michael Tomasky, now that he is finished swallowing his gum from watching the Lightworker flail about like… someone who went from undistinguished state Senator to President of the United States in four short years, all the while learning not a darn thing… would like to offer the President a counter-narrative. The story, in a nutshell, is this: we inherited a total disaster, things are getting better, and Romney will bring us back to disaster. The last part is the most important: putting the emphasis back on the challenger. Because apparently not even the Online Left is willing to really pretend that this administration can be trusted to come in out of the rain. But enough cheap shots and other innocent amusements: let’s unpack this argument. Such as it is. Don’t get me wrong: I agree with the sentiment expressed by an unnamed McCain staffer today in regard to watching Team Obama trying to do damage control after the President’s disastrous commentary on the private sector – and possibly even more disastrous spin.